Kazakhstan lies in Central Asia, bordering Russia, China, uzbekistan and the Caspian Sea. This huge country is the size of Western Europe and includes mountain areas, flat lowlands and fertile farmlands. Northern Kazakhstan is cold, while the southern areas have a milder climate. Kazakhstan, a former member of the Soviet Union, was the last country to declare its independence from Russia in 1991. Since then, it has slowly emerged as an economic power. Kazakhstan has vast natural gas and mineral resources. Unfortunately, the country is dealing with toxic nuclear waste left from the Soviet era, as well as polluted water and increased problems with drug abuse and crime. 16.2 million people live in Kazakhstan. 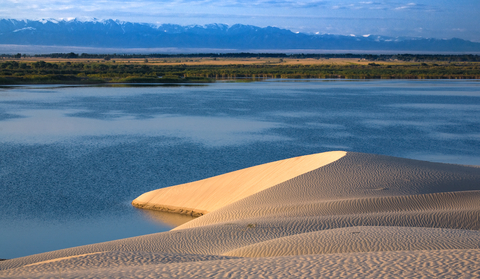 Kazakhstan has 1,049,155 square miles of land. The official language is Kazakh, although many people speak Russian. Visit the BBC to learn more Kazakhstan. Question: Who lives in Kazakhstan today? Answer: Kazakhstan is one of the most ethnically diverse countries in Central Asia. More than 50 percent are Kazakhs. One-third are Russians, although many Russians left the country after it declared independence. Declan, Tobin. " Fun Kazakhstan facts for kids ." Easy Science for Kids, Apr 2019. Web. 23 Apr 2019. < https://easyscienceforkids.com/kazakhstan/ >.